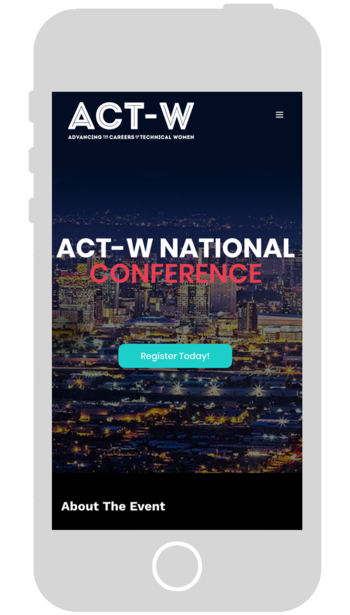 ACT-W: Conferences for Women in Tech. At ACT-W, there's something for everyone, regardless of how technical you are. 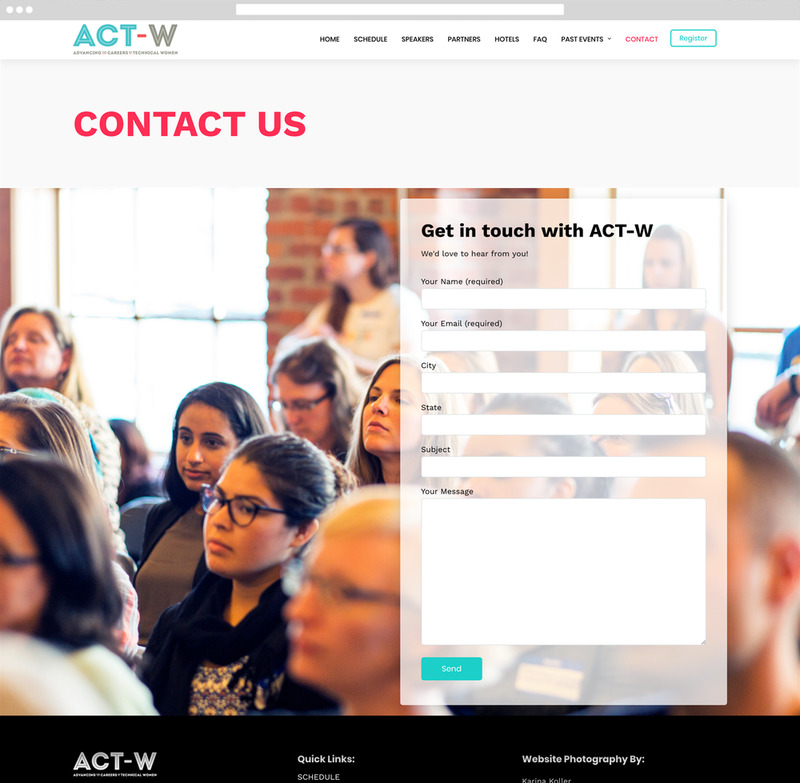 Continuing to develop a working relationship with ChickTech, I was asked to revamp the ACT-W website to increase views, which as result can potentially increase registration numbers. Going into the meeting with Chicktech leadership, I was presented with the expectation to utilize the current look/theme and make some changes. That all changed with a single question: "Why don't we change the theme to something we actually like, something that works with conferences?" Instead of having to gain familiarity with the theme they had, I was able to create something unique using the theme they wanted to use. All of which was incredibly exciting to me and I was able to wow them with my expertise and thoroughness. This project landed in my lap after a quick meeting with ChickTech about how they felt about the current state of the ACT-W website. They wanted it to look corporate and worthy of press. During the meeting, the idea was floated to completely redesign the site. I said, OK! After developing the main/national site, we set our sights on the regional sites. I was tasked with creating a template that they could continue to utilize for each chapter. The major expectation of the project was to create something awe-inspiring in a short amount of time. At first it was to adjust the content within the current design and during the course of the planning meeting was switched to a complete redesign of the national website. The theme that we switch to allowed for a lot of custom code and was truly easy to implement and design within. Due to the conference occurring within a short amount of time, it was imperative that the site be mostly done in 2 weeks. While this timeline is usually quite difficult to achieve, I was able to focus on the tasks at hand and truly able to meet and exceed their expectations. All within the holiday season as well! 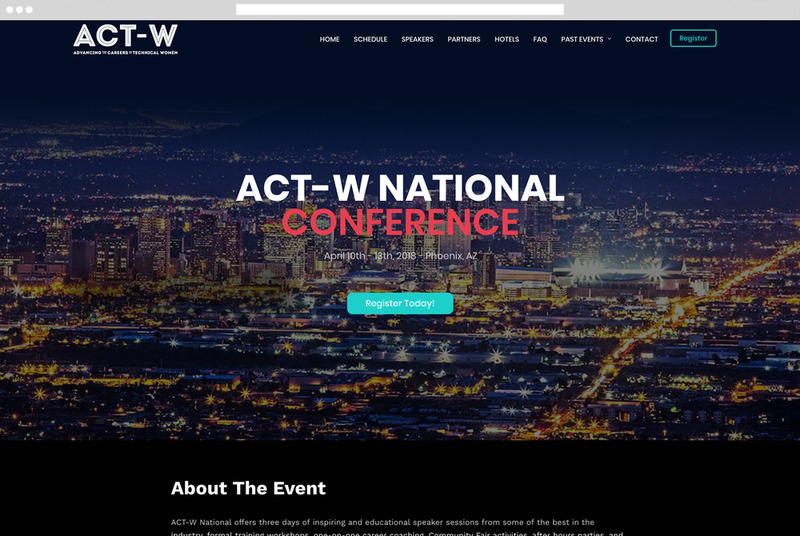 ChickTech and ACT-W is very focused on bringing attendees to their sites for information about their events and conferences. I was brought in primarily to fix and adjust the previous design because they felt it didn't portray them as this wonderful powerhouse of empowered women that they truly are. They wanted a site that shows their high-end corporate side which can potentially drive up registration for the events they host and create. This group of users is highly technical and they primarily view the site on mobile and secondarily via desktop. Understanding their needs during the conference and where they are most likely to click/tap was very important during the development of the site as well. Ensuring the schedule and speaker sections were well populated with information and content. With my previous experience of creating seamless online experiences using Wordpress, as the lead UX/UI designer I led the team in making changes requested from users, customers, and ChickTech. In order to identify the problems with the website and the next steps to take, we started out by making the site aligned with user needs after discussing a list of changes. We wanted to make the site function better and provide customers a better experience. After going through this list of feature requests and changes, ChickTech made the decision that to truly meet the expectations of the users and attendees of the conference that a complete redesign was the best option moving forward. After this we were able to pinpoint areas of opportunity; visitors wanted an easier way to view the conference schedule, they also wanted to have it look more streamlined and prepared. Although we knew to truly grow the site to something more would require more resources, we focused entirely on the user experience in viewing the conference schedule and proceed to design the site around that experience. The objective of the website was to keep the user informed during the conference and allow for an easy way to view sessions they would like to attend. We accomplished this by keeping the overall design very visual with large photography, strategic use and placement of text, vibrant color use, keeping an eye on how it functions on mobile devices, and an overall corporate look that encourages interaction. Once we landed on a fully customizable theme that could provide the high level of enhancement we wanted, it was also important that after installation, it would be easy to change and customize on the fly. So far, feedback from users has been extremely positive. So positive we extended the creation of the theme into the rest of the network of sites. Inspiration for the site came from other conference websites and the theme itself. The background is a simple white with an occasional light grey background to differentiate sections and provide eye rest. Keeping the overall design simple allows for the conference information to speak for itself. It's not a Wordpress site if there isn't a little bit of troubleshooting involved in it's creation and continued maintenance. Recently, I found the site breakpoints on mobile didn't quite fit the way I liked. Using some Custom CSS, I hid the register button that kept loading on top of the logo only at a small breakpoint/media query. Thoroughly testing, it worked fantastically and I continued to keep testing on how the site looked on mobile. Shortly after finishing the main development of the site, ChickTech returned to me to create a template that can be used to clone the rest of the network. While it did take some time to complete, they were pleased with the resulting site.